Seal gaps between surfaces smoothly and seamlessly with the right caulking gun for your particular projects. 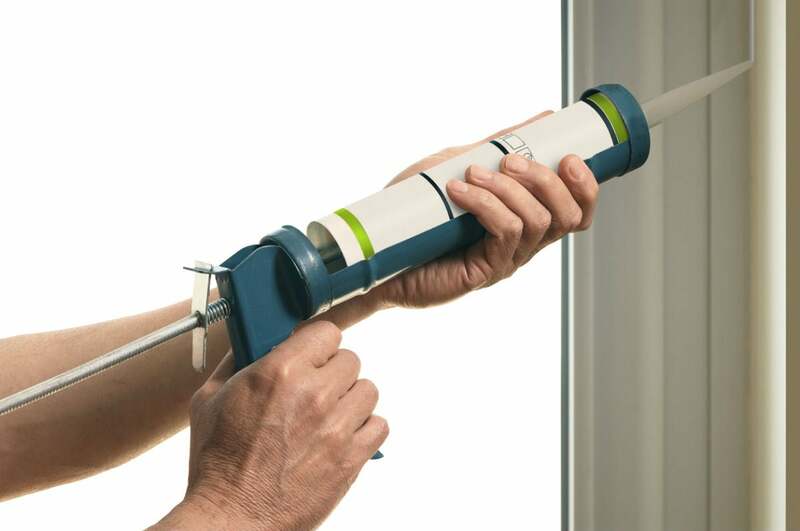 All caulking guns have a single purpose: deliver a continuous bead of caulk in order to seal joints between two surfaces, such as gaps between window frames and jambs. The majority of the caulking guns used today are manual, meaning you squeeze a hand trigger to dispense the sealant. Powered caulking guns—the new kids on the block—are growing in popularity because all you need do is guide the tip of the gun to create a smooth, continuous bead of caulk. While the sight of dozens of options on display at home improvement stores (or online) may seem daunting, if you follow these tips to understand the basics of how these tools work, you’ll easily choose the best caulking gun for the job. Check out the rod. Squeezing the hand trigger on a manual caulking gun forces a rod into the back of the tube of caulk, which in turn pushes the caulk out of the tube’s tip. There are two main types of gun rod that vary slightly in performance. Ratchet rod: Caulking guns with ratchet rods (serrated rods that “catch” with each hand squeeze) are inexpensive and suitable for light projects. The biggest problem with ratchet rods is that the sealant keeps oozing out until you twist the end of the rod and pull it back to release pressure. This can make a mess and lead to wasted sealant. Smooth rod: When you’re done applying caulk with a smooth rod caulking gun—often advertised as “dripless”—you need only depress a thumb lever to release pressure on the sealant. Get the right thrust ratio. 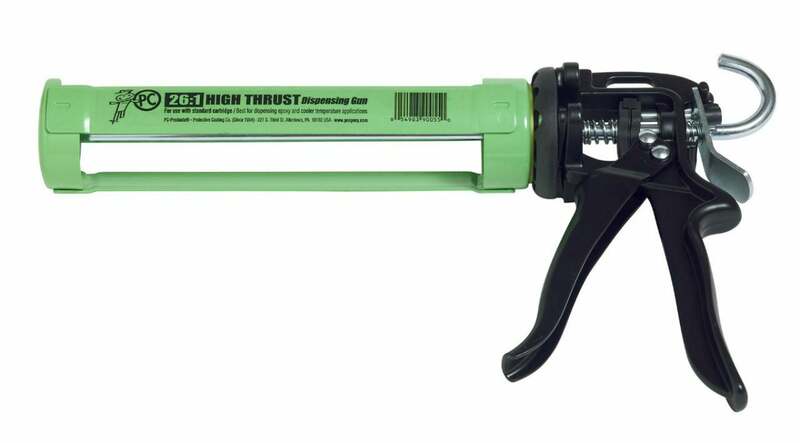 Look for the thrust ratio on the caulking gun’s package or in its the online description. Thrust ratio relates to the amount of force generated each time you squeeze the hand trigger. The higher the ratio, the more force exerted with each squeeze. This is important because different types of sealant are more or less viscid (thick). With thicker sealants, more thrust ratio is required to dispense the sealant. Thrust ratios run from 3:1 to 28:1. Guns with lower ratios are suitable for dispensing thin types of caulk, such as water-based, latex caulk, while higher thrust ratios are needed for dispensing more viscous types of caulk, such as epoxy sealants. Look for a revolving frame to caulk around corners. Stopping and starting when running a bead of caulk can lead to unsightly lumps and bulges. It’s especially challenging to run a continuous bead around a corner because you must change hand position and the angle of the gun. With a revolving frame, however, as you round a corner, simply rotate the frame (instead of the whole gun) to caulk without interruption. Save product with a sausage gun. It sounds like a breakfast tool, but a sausage gun is actually designed to hold collapsible foil cylinders of sealant, called “sausages.” These caulking guns, which operate in much the same manner as others (manual or powered), let you squeeze every last bit of sealant from the sausage, so there’s very little waste. Consider a powered caulking gun. Repeatedly squeezing a trigger can lead to hand and wrist fatigue, which is why powered caulking guns are becoming more popular. When they first hit the market a few years ago, powered caulking guns were reserved for commercial and industrial projects. Today, DIYers are discovering the benefit of letting the gun dispense the sealant so they can focus on creating a smooth bead. With no hand trigger, thrust ratio does not apply. Instead, you’ll regulate dispensing pressure via a light squeeze on the finger trigger. 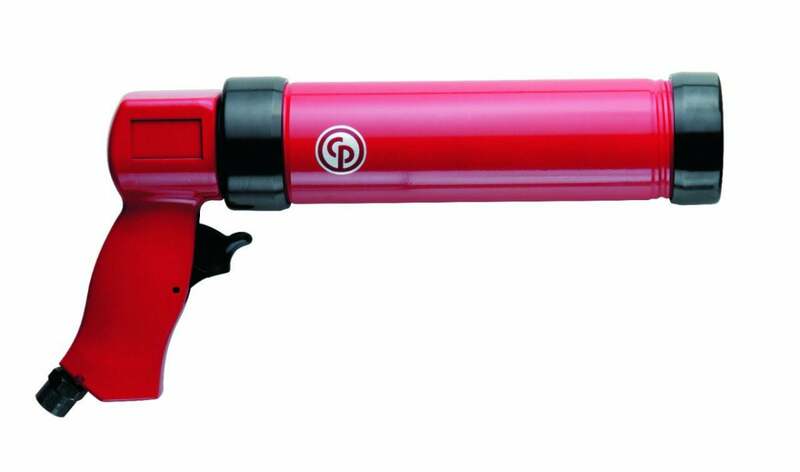 Electric: Like other electric tools, an electric caulking gun comes with a cord and requires access to an electrical outlet. Light pressure on a finger trigger allows you to dispense just the right amount of sealant. Battery Powered: This bad boy has removable batteries and a charger, so you can run a bead of caulk in locations where electricity isn’t available, typically running two to three hours per charge. If you have a lot of caulking to do, consider investing in an extra battery so you won’t run out of juice before you’re done. Pneumatic: Air-powered caulking guns are among the most popular powered options for home workshops because there’s no battery to charge and they interchange with other air-power tools, but you will need an air compressor. In addition to the gun’s finger trigger, dispensing pressure can be regulated by adjusting the pressure on your air compressor. There’s no need to invest in an expensive gun for occasional small caulking projects, such as sealing a gap between the tub and the wall. 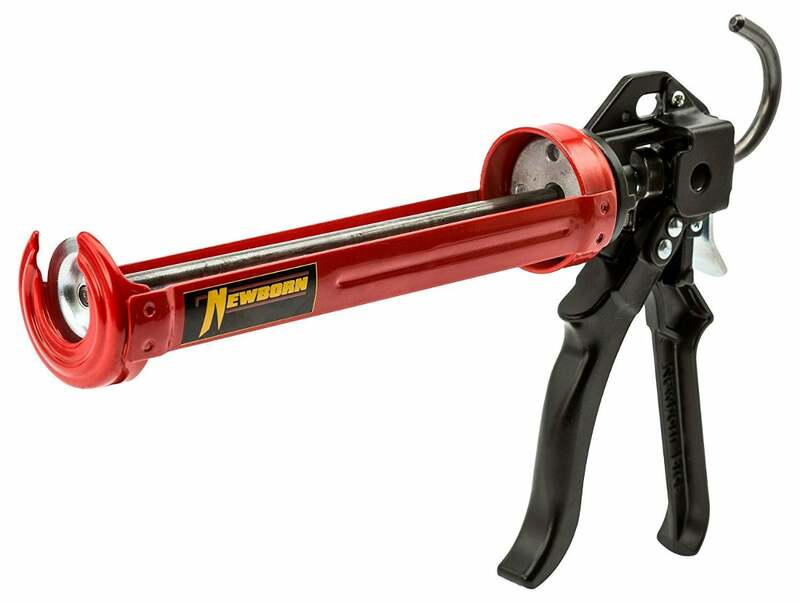 The nicely priced Newborn 188 Super Ratchet Rod Cradle Caulking Gun has traditional ratchet rod technology, and with a 6:1 thrust ratio it’s best for dispensing low viscosity sealant, such as painter’s latex caulk. It comes with a built-in pin for puncturing the seal on the caulk tube and a built-in cutter to nip off the tip of the tube. 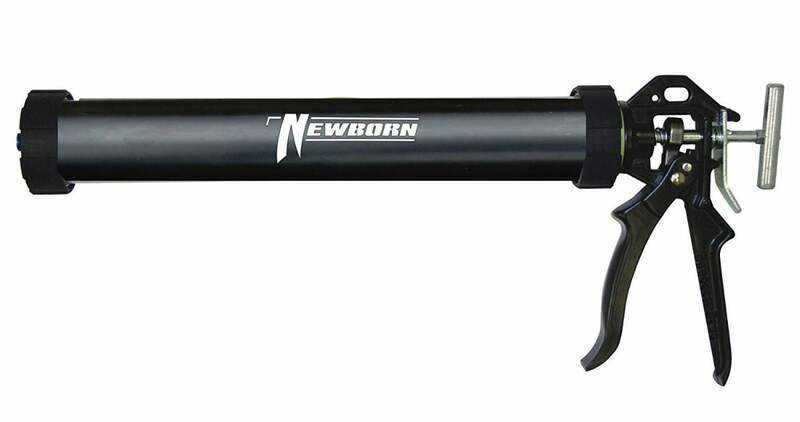 Amazon buyers give The Newborn 188 caulking gun 4.4 stars for price, soundness, and dependability. making it well suited for latex and silicone. Amazon buyers love the gun’s smooth-pull hand trigger and dripless technology, awarding it a hearty 4.4 stars. It comes with a built-in seal puncturing tool, a cutting tool, and a handy hook for hanging the gun on a ladder rung. With its revolving frame, the Newborn 250 Smooth Rod Revolving Frame Caulking Gun makes caulking around corners a snap. No need to start and stop—simply rotate the barrel and the angled tip of the tube rotates to the correct position to continue running a bead. The Newborn 250 is built to last, with a zinc alloy handle to reduce corrosion, and it features a hefty 18:1 thrust ratio to easily dispense medium viscosity caulk, including butyl and acrylic. It comes with a thumb release for dripless operation. Amazon buyers give the Newborn 250 4.6 stars for quality construction and ease of caulking around corners and in tight spots. 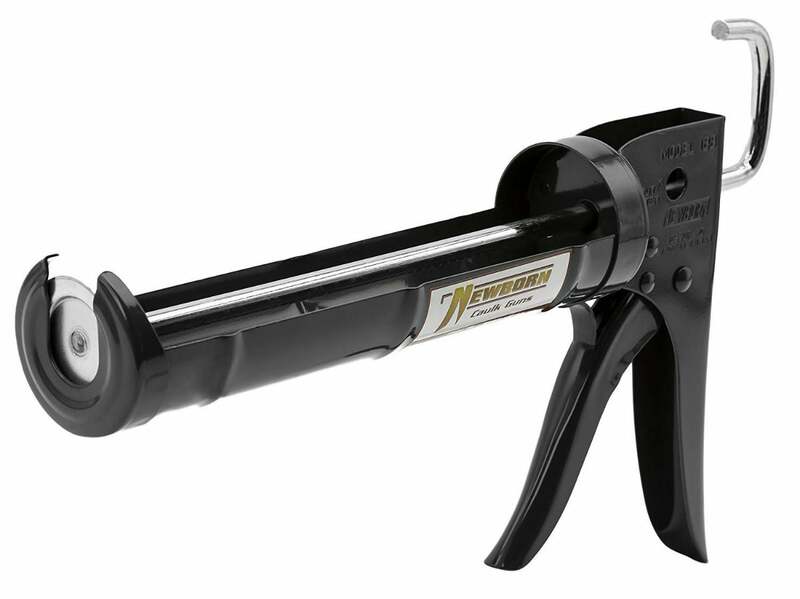 With a high thrust ratio of 26:1, the PC Products Steel Caulking Gun is a workhorse that smoothly and easily dispenses thick sealants. 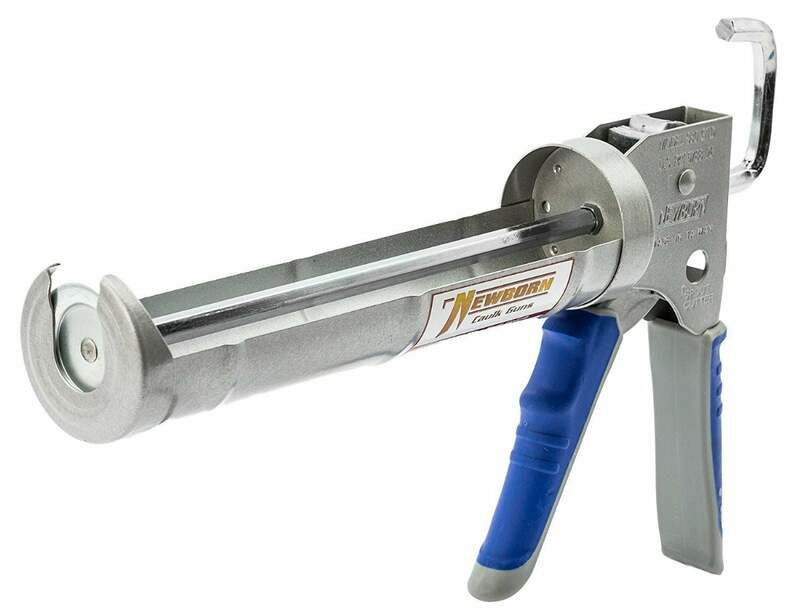 The gun can be used with any type of caulk or sealant, but its main purpose is to dispense high viscosity sealants, such as concrete epoxy. It features a smooth rod and a thumb release to prevent oozing and waste. At 4.7 stars, the PC Products Caulking Gun has one of the highest ratings on Amazon, in addition to some of the happiest customers, who rave about its quality steel construction and stellar performance. 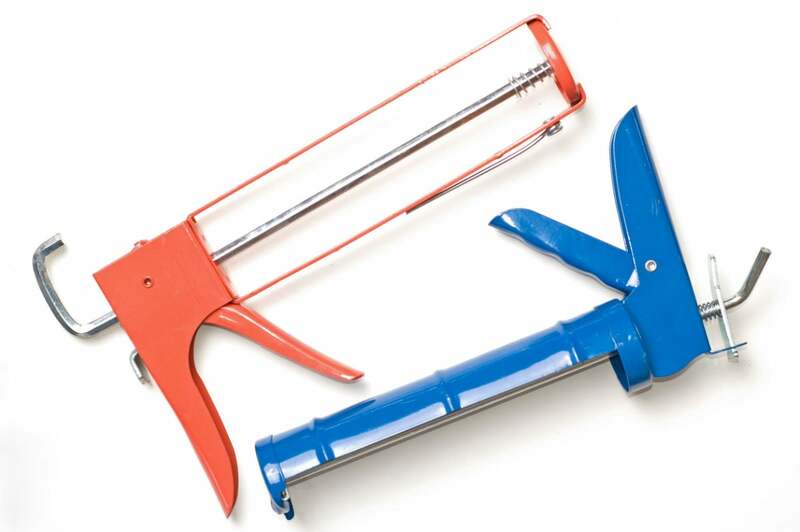 If you need just one caulking gun to use for multiple types of caulk—look no further. An investment bound to pay off in time, the Newborn Round Rod Sausage Gun features an 18:1 thrust ratio to easily handle both light and medium viscosity sealants. It comes with three cones (dispensing tips), a ring cap (to hold the cones in place), and an easy release thumb plate. Plus, you can use it with standard caulk tubes as well as sausages. Amazon buyers award the Newborn sausage gun with 4.6 stars for durable construction, ease of use, and precision caulking application, claiming it works just as well as even pricier sausage guns. Whether sealing every window in your house or constructing a full set of cabinets in your workshop, with a large caulking project, you’ll appreciate effortless caulking with the Chicago Pneumatic Air Caulking Gun. Amazon buyers give this powered caulking gun an enthusiastic 4.5-star endorsement, calling it a “cramp saver.” For ease of use, versatility, and ability to adapt to light or heavy viscosity caulk without a glitch, the Chicago Pneumatic Air Gun is a keeper.